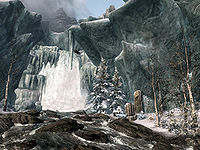 Forgotten Vale Overlook is a small isolated river valley, with falls at the southern end, that fed the frozen lake. The exterior to this valley is Forgotten Vale. It can only be accessed via the Paragon Platform, using the Emerald Paragon, or by using shout Whirlwind Sprint standing on one of icebergs outside Temple Balcony. The portal transports you to the eastern bank of a fast flowing river in an isolated river valley. There are no enemies found here. There is a stone arch forming the portal allowing you to return directly to the paragon platform, with fallen masonry all around. The river is wide, but also fast flowing with many rock lying in the water causing rapids. Both of the riverbanks are cluttered with further masonry and fallen trees. Head downstream, by staying on the eastern bank and out of the water, to avoid being swept over the falls accidentally. Just to the right of where the falls go over the edge is a small area of land, where you will find a skeleton lying beside an unlocked stone chest, with an elven enchanted greatsword, a quiver of elven arrows, a random enchanted bow and Unknown Book, Vol. II all on the ground on the other side of the chest. Looking up towards the northwest and you'll see part of the Inner sanctum on top of cliffs above you. This page was last modified on 17 July 2017, at 21:28.